Live the good life with the pastoral escape of a Tuscan bathroom. A bathroom inspired by the villas of Tuscany is a warm and inviting haven. To get this down-to-earth look, start with the golds, greens, and browns of the Italian landscape. Add elements inspired by the wrought iron benches, stone fountains, and greenery of Tuscan courtyards. Then personalize it with your own touch of Italy, from your grandmother’s millefiori collection to your favorite Italian scents. By combining the right materials, colors, and accessories, you can turn any bathroom into a restorative retreat with an enchanting Italian accent. From iron garden gates to terra cotta urns to travertine courtyards, the Tuscan style is rich with rustic materials. Even if your bathroom isn’t wall-to-wall marble, you can enjoy stone details like a travertine soap dish and lotion dispenser. Sculptural candlesticks, like Florentine Marble Candlesticks from Lamps And Décor, add old-world style. Top them with Vance Kitira’s Timber Pillar Candles from Bo Danica. The rough finish and dark cranberry red of the candles hold their own with the grandeur of the candlesticks. 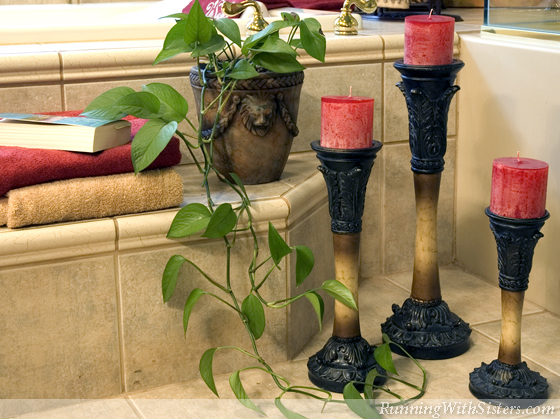 Terra cotta pots are a natural for any Tuscan room. Fill these earthen containers with your favorite plants to capture that courtyard feeling. For architectural impact, flank your tub with topiaries. The swirling shape of the Italian Cypress Spiral Topiary by Home Decorators Collection mimics the ubiquitous trees perfectly. 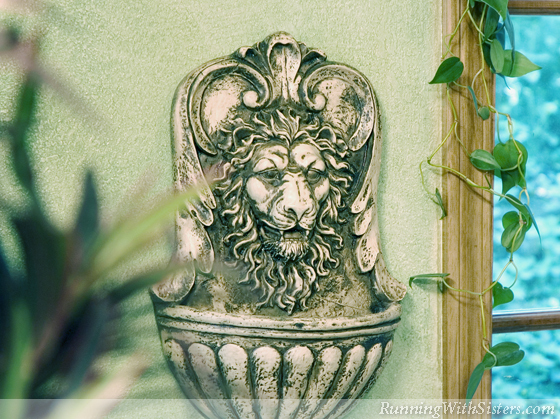 For good luck, hang Design Toscano’s Villa Marchetti Lion Wall Font over the tub and make a wish. The look is one hundred percent authentic, but the “stone fountain” is neither stone nor fountain, so you can put it anywhere (no plumbing needed)! When it comes to the Tuscan bath, picture the grand, sweeping landscapes and think big. Large wrought iron pieces provide that scale and are the right style for a Tuscan bath. Place a baroque towel stand next to the bathtub or go for a tabletop version like the Tuscany Vanity Towel Stand by Iron Accents. If your bathroom is as vast as the Italian countryside, you might have room for a wrought iron vanity bench to perch on while you paint your nails and sip your cappuccino. Ceramic canisters usually reserved for the kitchen can be perfect large-scale storage containers in the bathroom. Group them on your tub surround for a big splash of color. Look for opaque styles like Iron Accents’ Saffron Canisters by Belaverra. Who knew storage could add so much drama while artfully hiding unsightly unmentionables? Bravo! Bellissimo! For more color, look for accents in wine red, antique gold, and deep blue. A Majolica water pitcher combines these colors in classic Italian style. A cobalt blue olive tray is perfect by the tub for holding mineral salts. 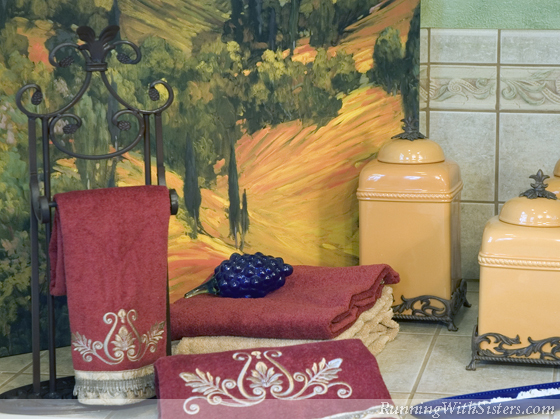 Get merlot towels embellished with scrolls that reflect the curves of the wrought iron pieces. 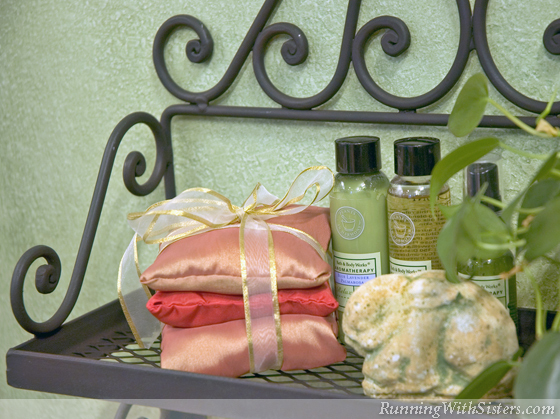 Pick out a few fancy towels and mix them with unadorned ones in a coordinating color. Skip the bath mat and roll out an ornate area rug that tells the same color story. Got an antique one? Magnifico! Infuse your bath with the flavors of Italy in aromatic soaps, salts, and sachets. 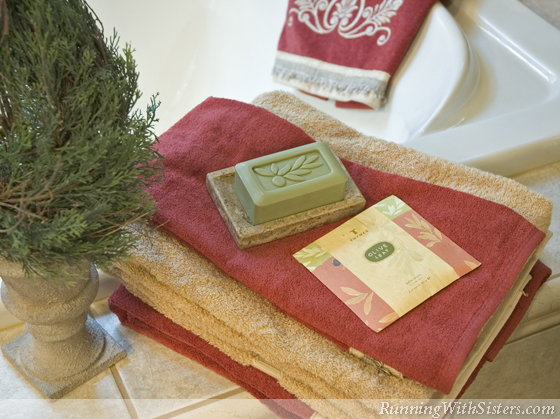 Indulge in soothing bath products like the Olive Leaf Triple-Milled Bar Soap from Thymes. Try exotic Italian scents like pomegranate body splash and black currant bubble bath. To make your own sachets, custom-blend dried herbs like sage, rosemary, sweet bay, and fennel. Once you have created your little piece of Tuscany, you can start living La Dolce Vita!